a next-generation molecular visualization program, following UCSF Chimera. Compared to Chimera, ChimeraX has improved graphics (e.g. interactive ambient shadows); faster handling of large structures (millions of atoms); and a more modern, single-window user interface. ChimeraX will have documented programming interfaces and an easy-to-use “Tool Shed” web repository of extensions. This ChimeraX alpha release is not currently available for CentOS 6 linux. T. D. Goddard, C. C. Huang, E. C. Meng, E. F. Pettersen, G. S. Couch, J. H. Morris, and T. E. Ferrin. 2018. UCSF ChimeraX: Meeting modern challenges in visualization and analysis. Protein Science. 27(1): 14-25. 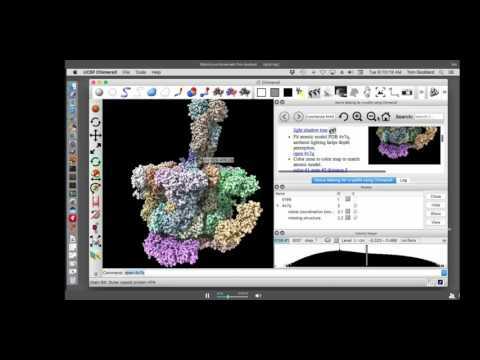 Acknowledge ChimeraX with: "Molecular graphics and analyses performed with UCSF ChimeraX, developed by the Resource for Biocomputing, Visualization, and Informatics at the University of California, San Francisco (supported by NIGMS P41-GM103311)." You may also cite the ChimeraX home page. Thomas Ferrin, Conrad Huang, Eric Pettersen, Thomas Goddard, Greg Couch, Elaine Meng, John Morris.